I think I might have some past life connection with Australian wineries. There is yet another excellent wine from Australia after Jacobs Creek that I am in awe off; Yellow Tail Wines. Big Bold Red. Yep, that's the name and it definitely lives up to its name. It is a humongous 1.5 liter olive green colored bottle of gorgeous red wine. Perfect for a party of three or four wine drinkers. Color: Rich, Viscous, Dark Maroon Red. 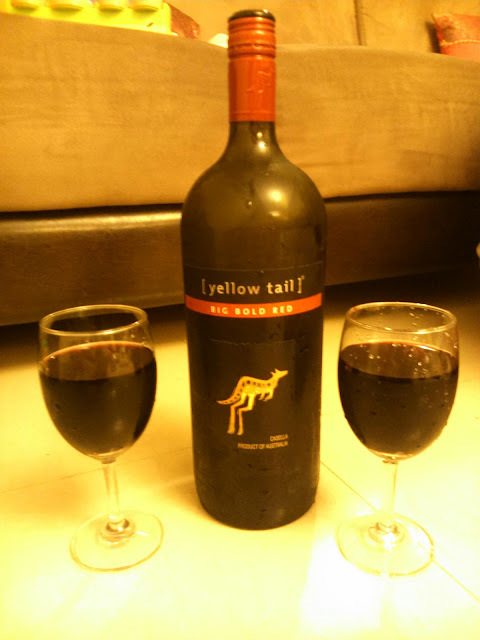 I would prefer usually prefer a chilled beer to a red wine during summers in Mumbai but this King-Kong of Wines (name suggested by the makers themselves) changed my mind. Chill this bad boy for an hour or so and it is a perfect party sipper even in peak summer. Rich aroma of the grapes and spices hits your taste node at sip. It is smooth on the throat, does not dehydrate and has subtle frenzy which makes good to go on a Sunday night. Serve: We had few spicy starters cause when you are having a red wine you need something spicy to blend in with flavors but this wine i felt did not restrict it self to just spicy food accompaniments, even vegetarian dish can be served like my Salad Platter. Hence I found it good party opener cause then you dot have to concentrate on food just enjoy the conversations. Cost: The 1.5 Liter bottle is priced at approximately 10$. PS: Wines are meant to sip and savor so do not gulp them down and drive..